Peanut free buckeyes are a traditional Holiday treat at our house. I always put together a plate of treats to bring to holiday parties and these are usually the first things to disappear! 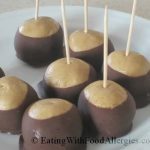 It turns out that even without peanut butter, they are a decadent treat that just might become a new Holiday tradition at our house! The beauty of these tasty little bites is that they don’t need to be baked and don’t require flour (making them an easy gluten free treat as well!) My son was skeptical when he looked at the “eyes” staring at him from the plate but after a little lick, he went in for a full bite…and was hooked! Next time, I better make a double batch! These peanut free buckeyes will be the first things to disappear from you holiday cookie plate. Nobody will know they are free of dairy, egg, soy, wheat/gluten, peanuts, tree nuts, fish, and shellfish! In a large mixing bowl, combine the sunflower butter, margarine, vanilla extract and powdered sugar (dough will be dry). Using a small cookie scoop or tablespoon, scoop dough and roll into 1 inch balls. Place onto cookie sheet lined with wax paper. Insert a toothpick into the top of each ball (this is for dipping the ball into chocolate later). Place in the freezer for 1-2 hours until firm. Pour the chocolate chips and coconut oil in a small bowl. Microwave for 1-2 minutes, stirring every 30 seconds, until chocolate is melted and smooth. 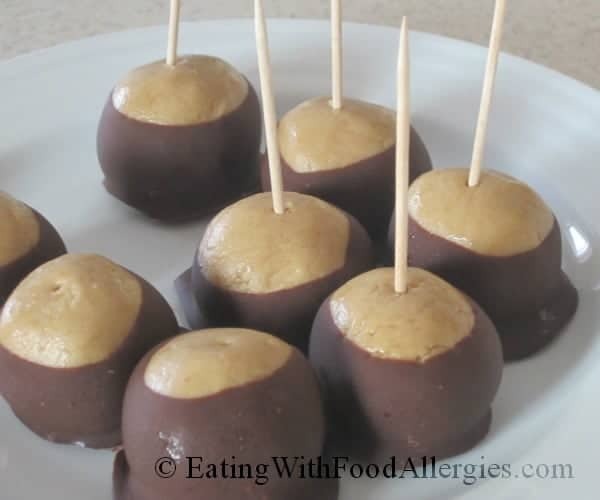 Remove the sunflower butter balls from the freezer and, using the toothpick, dip each one in the chocolate leaving the top uncovered (to look like a buckeye). Return to the refrigerator until ready to serve.